The Sounds Biography, Discography, Music News on 100 XR - The Net's #1 Rock Station!!! The Sounds is a Pop-Rock Alternative-Rock five-piece act fronted by the gorgeous blonde singer Maja Ivarsson; formed in Helsingborg, SWEDEN, the band's line-up also includes guitarist Felix Rodriguez, keyboardist Jesper Anderberg, bassist Johan Bengtsson and drummer Fredrik Nilsson -- AKA Fredrik Blond–-. The Sounds' debut CD, "Living In America", is one of the first albums from the indie record label, 456 Entertainment; made in 2002, when the band members were barely out of high school, the record debuted at #4 on the Swedish Albums chart. In U.S. the disc was issued through New Line Records reaching the #31 spot on Billboard's Top Independent Albums list. It firmly established the group and as one to watch as they played more than 300 gigs since its release, logging many miles on the Warped Tour as well as with The Strokes and Foo Fighters. "Dying To Say This To You", their sophomore full-length CD was released in spring 2006 going straight into the top 10 in their home country; the 10-song set opens up with the single "Song With A Mission" which became a minor alt-Rock radio hit in the U.S. where the album debuted at #9 on the Independent chart and reached #107 on The Billboard 200. That same year Maja Ivarsson joined Cobra Starship, a side-project of Midtown's Gabe Saporta, that had scored a Hot Modern Rock top 40 hit with "Snakes On A Plane (Bring It)". 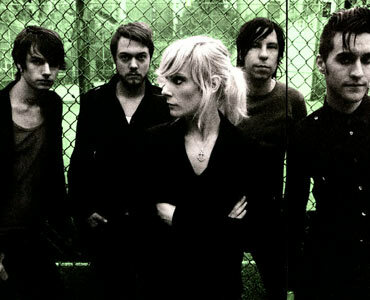 In June 2009 The Sounds resurfaced with "Crossing The Rubicon", an album which peaked at #69 on the American Billboard Top 200 chart, however the lead single, "No One Sleeps When I'm Awake", failed to make any impact on the U.S. Rock charts. With three albums under their belts, the Swedish quintet took a new approach for their next album, "Something To Die For", released in March 2011, made it the first album to be produced by the band. This new chapter also marked a new partnership for the group, with Los Angeles-based SideOneDummy Records, who joint-ventured with the band's own Arnioki Records. On October 29, 2013, The Sounds will release its fifth album, "Weekend"; the first single is the danceable album's opening track "Shake Shake Shake".